Benign gastric tumors are non-cancerous abnormal tissue growths that occur in the stomach. There are different types of benign stomach tumors, some of which arise from the inner stomach lining (mucosal) or others arising from the deeper stomach wall tissues and structures. Most stomach polyps are actually benign tumors but given the risk of cancerous lesions, all abnormal growths must first be investigated and cancer has to be excluded. 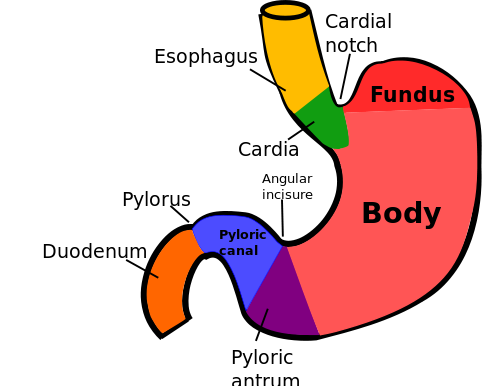 The majority of benign gastric tumors are small and therefore asymptomatic. It usually does not pose any problem but large benign tumors and bleeding benign tumors can affect the movement of food and gastric chyme through the stomach or lead to significant blood loss. Some benign tumors have the potential to become cancerous at a later stage. Surgical removal of the tumor is often the only viable treatment option. Overall benign gastric tumors are uncommon. Tumors can arise anywhere in the body and are a result of abnormal tissue growth. Normally the cells grow in an orderly manner and are restricted in number so that only a set amount of cells are present at any time. This ensures that the tissue is structured as genetically determined and can fulfil its function. With benign tumors, there is an excess of cells. Most of these cells are largely the same as the tissue from which it originates. It is not malignant (cancerous) and does not invade surrounding healthy tissue. However, these benign tumors can compress blood vessels or nerves and with the case of hollow cavities, like the stomach, it can cause an obstruction. There are a number of causes and contributing factors to the development of these growths. With benign gastric tumors, the risk is largely associated with chronic irritation of the stomach lining and wall. Repeated or persistent inflammation can eventually disrupt the regulation of the number of cells and masses of cells may form at a specific site. These masses or growths are the benign tumor. With the stomach, chronic infection with H.pylori (Helicobacter pylori) and other forms of chronic gastritis may lead to the formation of benign tumors. Some are inherited syndromes that lead to stomach polyp formation, the majority of which are benign growths. Over time these polyps may ulcerate. These open sores can the bleed and although minimal, bleeding may lead to anemia over a long period of time. Large tumors may eventually block the stomach outlet. Most cases of benign stomach tumors are asymptomatic. It is only incidentally discovered during diagnostic investigation, usually to assess other gastrointestinal symptoms. While small tumors present with no symptoms, larger or ulcerated tumors are more likely to be symptomatic. These symptoms, however, are largely non-specific. Given that benign stomach tumors are rare, various other more common conditions first need to be excluded as a possible cause, such as erosive gastritis, stomach ulcers and even stomach cancer. Abdominal pain usually in the epigastrium (upper middle part of the abdomen, just below the breastbone). Bleeding ulcers but the blood loss is usually so minor that it does not present with visible signs of gastrointestinal bleeding like hematemesis (vomiting up blood) or melena (black tarry stools). Anemia due to blood loss over a prolonged period. Nausea of varying intensity and usually worse after eating. Vomiting which can be projectile in the later stages. Bloated feeling which is a sensation of fullness in the upper abdomen. Early satiety where a person feels full after eating a small quantity of food. Benign stomach tumors can be divided into mucosal and non-mucosal tumors. These tumors arise from the inner lining of the stomach and protrude into the cavity. It can be divided into non-neoplastic and neoplastic polyps. Autoimmune gastritis where an immune-mediated reaction causes stomach inflammation. Radiation gastritis that arises after exposure to radiation. Specific genes which are inherited and predisposes a person to polyp formation. Long term medication use like with proton pump inhibitors (PPIs). A benign tumor arises with abnormal tissue growth that allows cells to proliferate at a site. This is known as hyperplasia where there is an excess of normal cells that compose a specific type of tissue. These excess cells causes masses in tissue or extends from the surface of tissues as is the case with polyps. Although benign tumors are non-cancerous, some have the potential to become malignant (cancerous) at a later stage. Since benign tumors of the stomach are largely asymptomatic, it remains undiagnosed for long periods of time. Some stomach polyps cause characteristic symptoms like darkening of the mouth but still requires further investigation for a conclusive diagnosis. It is usually found incidentally during gastroscopy, computed tomography (CT) scan and sometimes large tumors may be identified on X-ray. An upper gastrointestinal (GI) endoscopy is the preferred diagnostic investigation for diagnosing a benign stomach tumor. It allows for the collection of a sample (biopsy) which can then be examined microscopically to verify whether is benign (non-cancerous), pre-cancerous or malignant (cancerous). Surgery is often the only approach to treatment for benign stomach tumors. However, some may be treated with medication prior to surgical removal. The underlying cause like H.pylori infection should be treated to avoid recurrence. Most benign stomach tumors are small and can easily be excised (“cut”) with endoscopic surgery. These minimally invasive procedures are preferred over open surgery due to lower risk of complications and shorter recovery periods. Sometimes healthy stomach tissue, or even a portion of the stomach, is removed surgically (resected) along with the tumor. This is mainly considered for tumors that have a potential to become cancerous like gastrointestinal stromal tumors. Minimally-invasive endoscopic procedures can also be conducted for these type of tumors where a portion of the stomach may be removed. Although almost all benign gastric tumors do not respond to medication, gastrointestinal stromal tumors (GIST) can be shrunk pre-operatively with imatinib. This drug may also be used to treat certain types of gastrointestinal stromal tumors when there is recurrence in a patient or if cancerous (malignant). The prognosis is very good with proper treatment of benign gastric tumors. Most do not have the tendency to become cancerous (malignant). The recurrence rate is low if the underlying cause is treated appropriately. Some of these tumors, especially those types that are more likely to become cancerous, do tend to recur and need to be managed appropriately after surgery. In these cases, regular monitoring with endoscopic investigation is advisable in the long term.